Make sure your Bill of Lading is filled out properly with correct shipper and consignee addresses and contacts. Any additional services, such as origin or destination lift gate or residential deliveries must be declared. Special instructions must also be noted. It is highly recommended that you enter the number of pieces you are shipping under Qty, even if the shipment is palletized. This forces the carrier’s driver to count the number of items you are shipping. Palletized shipments may occasionally become reconfigured; without the piece count noted on the Bill of lading there is no proof of how many items were shipped. Item description, NMFC item number, freight class and weight will help ensure your shipment is priced correctly. Keep in mind LTL carriers weigh and inspect most shipments for accuracy. If your shipment is not described correctly, it may get corrected and additional charges will be due. Although in most cases shipments are picked up the same day they are called in, we recommend you provide the carrier with as much notice as possible. Traffic, weather conditions, and other factors beyond our control may affect our ability to perform the pickup of your shipment within the requested timeframe. Planning ahead to give the carrier ample time to perform the pickup is very helpful. Package your product properly to ensure it’s safe transportation and handling. Keep in mind your shipment will be handled several times and will ride with other shipments for hundreds or thousands of miles. 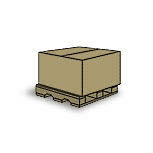 If your product is palletized, use a pallet that is compatible with the size of your product. If your product overhangs the pallet, you are exposing your shipment to potential damage. 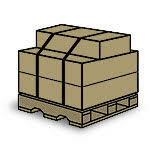 If you are shipping various size cartons and weights, make sure the heavy cartons are on the bottom. Place a piece of cardboard on the top of the cartons to protect it in case another shipment will be stacked on top of it during transit. Shrink-wrap the cartons to the pallet tightly so the cartons cannot fall of the pallet. Proper packaging is a must. Don’t ship your goods without proper protection. Many claims and damages arise from improper packaging — and packaging errors may eliminate or reduce your carrier’s liability. 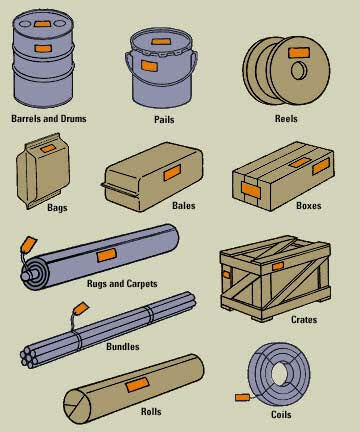 The pictures below should help you visualize the best way to package and secure your goods. 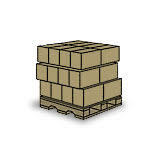 Cartons should be stacked squarely on the skid, with no overhang. Box flaps and corrugations should face up. Make the top surface as flat as possible. 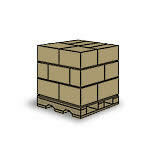 Damage can occur if cartons overhang the pallet, because there is no support for the freight in transit. 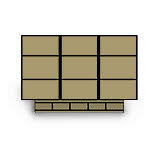 Damage can occur when a pallet doesn’t have a flat top surface. Place single containers on an outside corner or ship them loose. Loads made from different size containers may not be uniform enough to have unit strength. Stacking strength is lost when pallets are improperly loaded. Pallet overhang loses up to 32% of carton strength. Interlocked pattern loses up to 50% of carton strength. Misalignment loses up to 30% of carton strength. Labeling each carton with the shipper information and your customer name and address will help prevent shortages in case a part of the shipment becomes separated. There are several types of labels that can contribute to the safe handling of your shipment, that you may consider using. 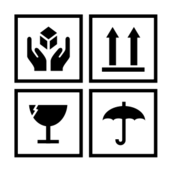 Labels such as “Fragile”, “Handle with care”, “This side up”, “Do not break down pallet:, “Top Heavy”, Do not stack”. 1. Stay in contact with your supplier to find out when your shipment was shipped, by which carrier, and an approximate arrival date. 2. When the shipment is delivered, inspect it immediately for obvious signs of damage. 3. Compare the number of shipping units received to the number listed on the delivery receipt. 4. Sign the delivery receipt. Be sure to make note of any and all signs of possible damage as well as the number of pieces you are receiving. The delivery driver will help you receive your shipment and answer your questions. A signed delivery receipt with no exceptions, is called a “clear delivery.” Clear deliveries mean that there were no shortages or visible damage at the time of delivery. If a shipment is either short or damaged, you should still accept the delivery. It’s the duty of the shipper and the consignee to mitigate or minimize the extent of the loss. After you accept the shipment, take steps to protect the shipment from further loss and file a claim for the actual shortages or damages involved promptly. Be ready to accept the shipment when the carrier comes. Most carriers will add a “second delivery” charge if they must make another trip to your business.